A USB phone is a computer peripheral that looks like a telephone and connects to a USB port on the computer. 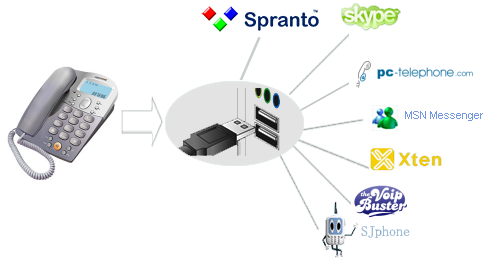 However, unlike other types of VoIP phones, USB phones have no VoIP protocol intelligence inside. Rather, they simply provide the audio and human interface to the VoIP application running on the computer. When connected to the computer, the computer recognizes the USB phone as an audio device. It is treated just like a regular audio card in the computer, allowing the user to play and record audio. VoIP software can use the USB phone for playing and recording audio, thereby allowing the user to use what appears to be a telephone to make VoIP calls. Because of the design of USB phones, they offer significant advantages over the use of microphones and speakers for making calls with a PC. For one thing, your voice conversation is not blasted out to your PC speakers for everyone around you to hear. The USB phone gives you privacy when making phone calls, very much like the regular telephone does today. USB phones also provide convenience for travelers, as well as home and business users of VoIP. For travelers, the USB phones are a great tool for making phone calls wherever you go. Most models are very compact and lightweight. For the home and business, USB phones can be used just as easily (and usually for far less money!) than traditional telephones. USB phones represent a great value and are a forward step in helping to turn your PC into a useful communications device. The value and convenience is unbeatable.